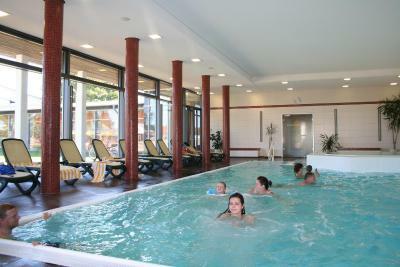 Lock in a great price for Familien Wellness Hotel Restaurant Seeklause – rated 8.7 by recent guests! Nice small room with provision for anything you'll need if you want kitchen type facilities, dishes and appliances neatly fit into the room, and a patio. The playgrounds and activity areas for children are top-notch. The breakfast buffet is also excellent. Excellent place to stay to explore the surrounding area. Fantastic people - very nice and professional! Everyone! Very clean, nice spa, big parking space. This place looks awesome for family vacations, especially during the summer. Amazing playgrounds for children, sauna/pool, free tickets for local transportation all around Usedom island. Lovely. Everything, the facilities were excellent, the staff friendly and helpful. the room was well laid out and comfortable. For families it is ideal, as most of the surroundings are playgrounds. Here breakfast is something to brag about, ten stars. Very spacious, comfortable rooms and enormous grounds with lots of family friendly facilities. Also, only 10 mins walk to a railway stop which is free for hotel residents. Familien Wellness Hotel Restaurant Seeklause This rating is a reflection of how the property compares to the industry standard when it comes to price, facilities and services available. It's based on a self-evaluation by the property. Use this rating to help choose your stay! One of our top picks in Trassenheide.This family-run hotel is in Trassenheide, on the Baltic Sea island of Usedom. It offers free Wi-Fi and free use of the pool and sauna area. The spa area is 6562 ft² in size, and includes a spa bath and gym. There are also massages, beauty treatments and courses in water aerobics, Nordic walking and aerobics. A shuttle bus can bring you directly to the beach, 0.9 mi away. For the duration of their stay at the hotel, guests enjoy free use of the UBB (Usedomer Bäderbahn) railway free of charge and all public bus lines on the island of Usedom including the town of Wolgast. When would you like to stay at Familien Wellness Hotel Restaurant Seeklause? Modern-style double room featuring a refrigerator, a satellite TV and a private bathroom with hairdryer. This apartment consist of a combined sleeping and living room. The kitchen features a dining area and tea/coffee facilities. Please note that children can only be accommodated if they are up to 16 years of age. This apartment consists of 2 combined sleeping and living rooms. The kitchen features a dining area and tea/coffee facilities. House Rules Familien Wellness Hotel Restaurant Seeklause takes special requests – add in the next step! Familien Wellness Hotel Restaurant Seeklause accepts these cards and reserves the right to temporarily hold an amount prior to arrival. If you expect to arrive outside of reception opening hours, please inform Familien Wellness Hotel Restaurant Seeklause in advance. Please also inform the accommodations in advance how many children will be staying with you, so that the accommodations can arrange the extra beds in advance. Please also note that payment is due upon arrival. Please note that pets are subject to a fee of EUR 21 per pet per night. What we liked the most was the breakfast! it was not the typical "European" buffet. Car parking fees at euro six per day are excessive, particularly for long stay guests, perhaps a courtesy waiver would be appropriate point for management to consider if they wish to encourage long stay guests. Stayed here on business for a total of 42 days. While my commute was 30 mins the hotel facilities made it worth while. Breakfast was excellent, same choices everyday but so many choices it never became boring. Room was adequate, all the standard facilities you expect and housekeeping standards were excellent. The restaurant offered a daily buffet style option or from the menu. Staying there so long on business the menu became predictable and they didn't offer specials. The recreational facilities are first class, the wellness suite offered gym, pool (a little small for serious swimming) sauna and steam room. Point to note, the sauna is naked. A superb bonus for the business traveller is the washing room, with three washing machines and tumble dryers that are free and modern. Across the road is a supermarket. This hotel is family themed, with lots of outdoor children climbing frames etc. So expect a lot of families, and grand parents with young children, pleased to say I was never disturbed by them. Car parking is available. Seeing as how there are saunas and a pool, finding no bathrobes or slippers in the room was quite disappointing. The entrance to the room after midnight. Tolles Familien Wellness Hotel ! The location, it is a 20 minute walk to the beach and the shuttle bus only goes every half hour until a certain time. Taxis have to travel about 20 mins from nearby town to get to the hotel.